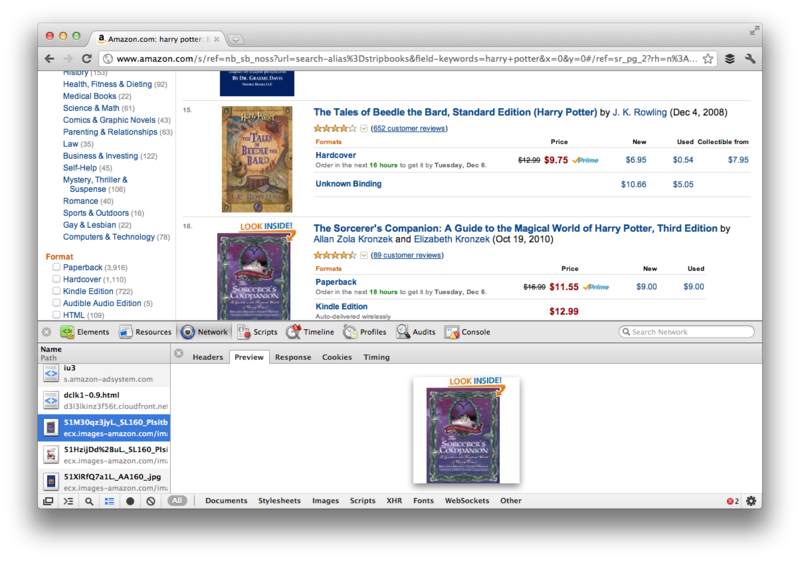 Let’s say the user searches for ‘harry potter‘, and the results are supposed to show 12 per page. Typically, 3 of these results would show up above the fold. When the results page loads, it loads up with data for 15 result items – but renders only 12 of them to the user. Only then does it make the AJAX call to the backend – and requests 15 new items. When these 15 arrive, it updates the bottom of the results area with the first 12, again keeping the data for the last 3 around, in case the user clicks on ‘Next »’. What a simple idea – nifty and awesome. Is Amazon the first site to use this technique, or am I just late to the party? It’s curious that Amazon has chosen to have a pagination length of ’12’, an odd choice. It’s possible their search system is optimized for requests that are multiples of 5, so it was easier to have a page length of 12 and request 15 data items, rather than have a page length of 15, and have to request 18 data items. While investigating this, I also noticed that Amazon doesn’t let you request paginated search results starting at an arbitrary page index – e.g., you can’t request page 8 of results while you’re viewing page 3. This makes sense, kinda. The side-effect is that, axiomatically, all search results load extremely fast! This precaching of a few search results make the user feel like the results appear instantaneously, which, technically, they did. While the user consumes the top few results, the rest of the results stream in, for an amazingly smooth user experience! This entry was posted in Posts and tagged amazon, ecommerce, search by amit. Bookmark the permalink. Interesting example where a simple micro-optimization can result in great deals. Whoa they patented it … a more general technique – Interlacing to show a blurred image and incrementally and load parts of it later to increase perceived speed is (or used to be) common. Although Wikipedia (http://en.wikipedia.org/wiki/Interlacing_(bitmaps)) says that this technique is not quite popular these days, I do see a blurred version of images when opening some old images on facebook. Interesting they did not use a simple double buffering technique wherein they could load 12 items in one buffer and before the user clicks on “next” preload all 12 items in another buffer.